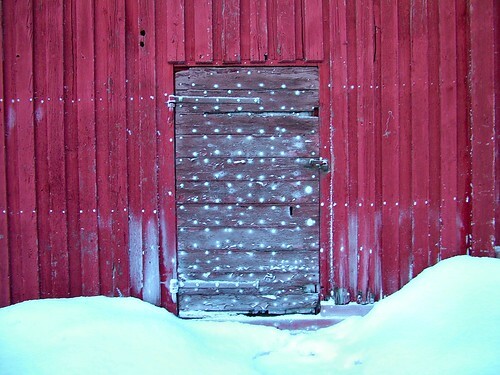 Oulu Door, originally uploaded by ccgd. I was in Northern Finland for most of last week, for work. It was the kick off meeting for a research project, funded through the EU's Northern Periphery Programme. It is an interesting project, comparing innovation systems and public sector innovation support mechanisms in Northern Scotland, Northern Sweden and of course Northern Finland. Oulu was fun, albeit dark - very dark. I've been there a few times before, but only in May to October. January is quite different. What surprised me was the level of lighting throughout the town, and on the roads, which gave the snow a strange sodium yellow tinge. Weird. Sorry Kids - no bread today, originally uploaded by ccgd. 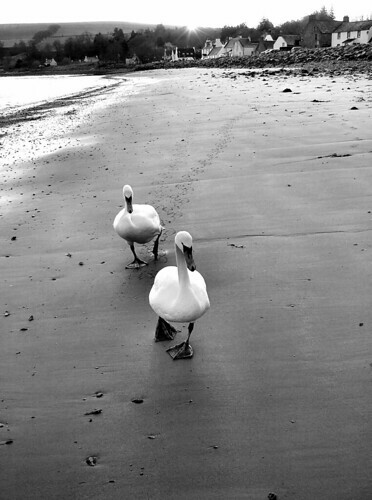 Chased down Cromarty Beach by a couple of swans. Made the Flickr top 10 for the 18th January. Demob Leave 1946, originally uploaded by ccgd. My father has written the following for The Australian Clan Davidson Magazine. A great piece of prose, worth recording under this photo of him in 1946, just returned home to Scotland after three years of war. It was almost mid 1945 when , bound for the Pacific War, we, sailors of the Royal Navy. stared at trees with the leaves staying on but with the bark peeling off. We heard the wailing of a train like the sound in an American Film , and glimpsed white girls in summer frocks. 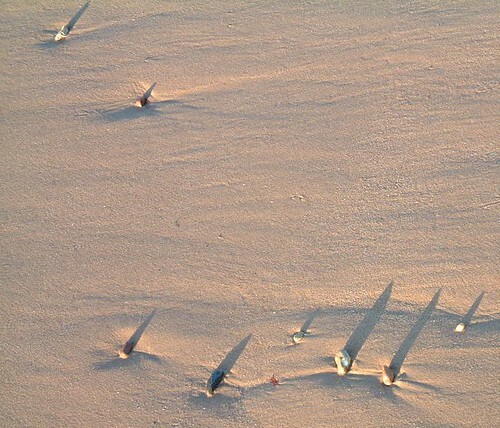 We had landed in Jervis Bay, New South Wales from the carrier HMS Vengeance and could not quite believe what we saw. There were street and house lights everywhere, there was no blackout. There was food galore in the mess, even fresh fruit juice. It’s not that we were unused to strange sights. We knew bombed London and stark war airfields near smoky industrial towns of the English Midlands. We had sailed, in and out of the Clyde, with its odd night ‘run ashore’ in dour Glasgow, through heaving seas of the Western Approaches of the Atlantic as the carrier squadrons flew and operated. We had lined the flight deck and scanned the crowded shipping in Gibraltar, confined without shoreleave to the iron restraints of a carrier run with exact Naval discipline. We had accepted minimum rations as the planes flew in and out of the airfield called "Hellfire" [ Halfar] in Malta. The war in Europe was drawing to a close and we had sailed eastwards through the Suez Canal in and out of the ports of Alexandria. and Aden, of Madras and Trincomalee and had sweated in the jungle airfield of Katakarunda in the then Ceylon. Now, after years of wartime Britain, and months of seatime, we just could not believe this - Australia. It was like a pre war film, or glimpses of a way of life that was lost in our youthful memories. A weeks leave, train to Sydney, and the incredibly friendly welcome of the Australians to us young men, mostly teenagers, was tremendous and left a warm glow in our hearts. It was so marvellous that it could not really be happening. But the interlude was too brief. We sailed north to Manus, to Leyte and through into the Jap war in the Pacific, leading to the surrender of the Japanese Forces in Hong Kong to the British Fleet, and to four months of nominally peace time duties based mainly at Kai Tak Airfield. Afloat again and south to Borneo to embark and repatriate Australian Army Veterans of the New Guinea campaign, landing them at Sydney. A welcome ashore again and we were based at Schofields Airfield. After Hong Kong and famine in the crowded streets, with Jap P.O.W.sC amps and, Chiang Kai Chek’s eight man wide Army Columns pouring at the double through the streets for embarkation in American Liberty ships en route north to then named Peking, Australia was again a ‘ too good to be true’ paradise. The helpings of food were more than our concave stomachs could take. There was ‘ no cockroaches in the jam ‘. There was shore leave and the afternoon train to Sydney, and on to the Dance Halls and cinemas, to house parties and Bondi Beach, and everywhere a open welcome from Australians of all ages. ‘All good things come to an end ‘ and , as HMS. Vengeance wallowed westwards through the Tasmanian Bight bound for the Indian Fleet, I received a telegram from my father’s cousin Bill Davidson and his wife, whom I had briefly visited in Melbourne, wishing me a Happy 21st. birthday! I had forgotten what day it was after some three years of naval service. I had however a continuing link with Australia. In pre war years there were two surviving strains of one branch of the Garioch Davidsons descended from one mid 18th. C. Gardener and Land Measurer in Glack Daviot, Aberdeenshire . 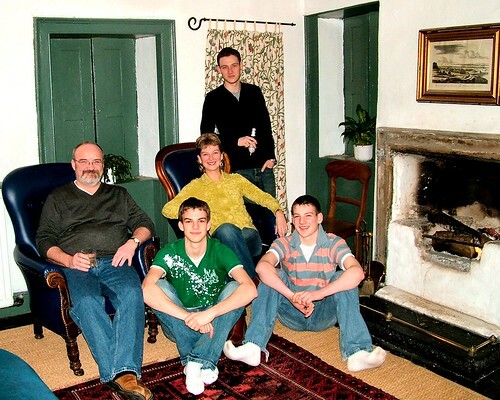 Each had a son of the same name as the father. The eldest by a year or so was Jackie, born in India and, on the early death of his mother, spent his boyhood with his grandmother and aunt in Airdrie in Scotland. The younger, Charles, the writer, was born and brought up in Aberdeen and was to be orphaned within the year of his meeting with Jackie in 1938 at a family wedding. Both were offered the opportunity to emigrate to Australia with Jackie’s uncle Bill Davidson, who was married and already settled in Melbourne. Jackie opted to go with his uncle to Melbourne served throughout WWII with the Australian services in Borneo. Charles remained with his sisters and aunt in Aberdeen joining the Royal Navy. 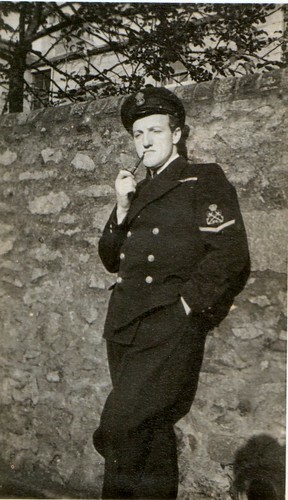 and by 1945, was a 20 year old Petty Officer [Air Wireless] in the Fleet Air Arm. Sixty years pass, and a belated thank you was offered by the British Government to the dwindling remnants of WWII service personnel in the form of a grant to them and their partners to aid them to revisit the scenes of their Service years. It was called " Heroes Return " ! On through Armidale to stay with Ruby’s son and his wife and family in a spacious newly built house on a farm a few miles out of that pleasant University town and its extended campus. In Armidale we were made welcome by Jackie’s widow, the Australian girl whom he had married after New Guinea. We did enjoy making her acquaintance. She was intrigued to meet a cousin of her husband from his distant Scottish boyhood. Waterfalls and ravines, Gum trees and gorges, kangaroos and kookaburras, ferns and spacious farms – everywhere a mixture of British customs, food and names coupled with strange plants and flowers, and adaptations and developments of the UK way of life to suit the different climate and circumstances. Three lots of Davidsons lunched at the RAC Club in Sydney when Frank Davidson, the Australian Clan Davidson Association President with his wife and stepson met our hosts Merrilynn amd David and Nancy and I. My wife loved it all and was fascinated to see in the Australian Museum of Flight on the airfield near Jervis Bay where I had served, a Fairey Firefly aircraft, the same model which I had flown over Sydney Bridge in early 1946. I was transported back through 60 years to that formative period of my life. I write this in wintery Scotland. Australia may be very far away, but Oz and its people and our family there, are near in our thoughts. 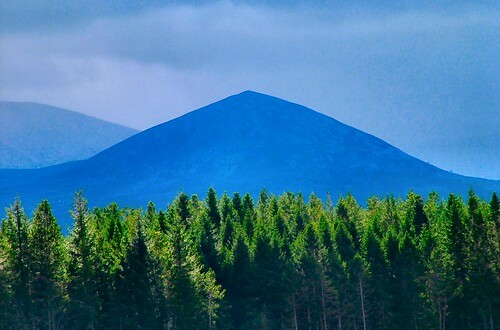 Cairngorm view, originally uploaded by ccgd. Magnus was racing at Badeguish in September, and I took this zoom shot in the late afternoon. The angle highlights the almost perfect symmetry of the hill, although the light was poor. Looking at the photo later I cropped it tightly, and saturated it very heavily to bring out the blues and greens. Sunrise over Eathie, originally uploaded by ccgd. Shaft of Sunlight, originally uploaded by ccgd. 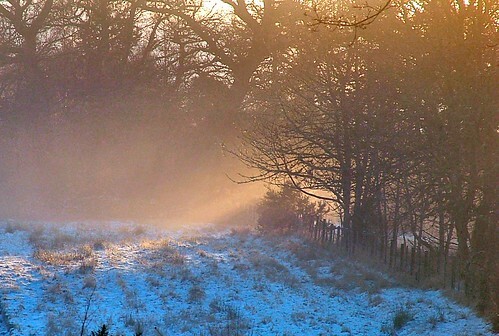 Hogmanay dawned fine, then the mist and harr descended back over Cromarty. Magnus was out for a training run, and ended up at Tim and Dawn's house about 10 miles from home. It was just out of the mist, but the road home was a peasouper. I called Magnus, said that I would pick him up in the car, and took the chance for this shot, and others, at the "event horizon" of the mist and the sun. 2001 A Space Odyssey, originally uploaded by ccgd. 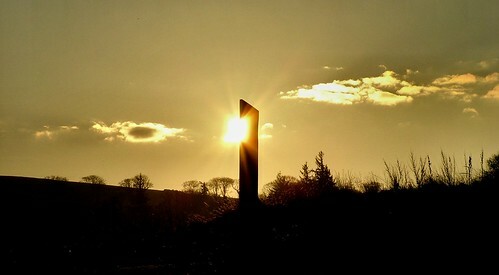 The sun rises behind the Emigration Stone on Cromarty Beach. "The Transocean Wildcat cold-stacked in the Cromarty Firth"
"You often use what sound like technical terms (“cold-stacked”) when speaking of rigs. Does everyone in a village like yours develop a basic vocabulary with which to discuss the rigs that are constantly in view (and perhaps on which some residents work), or does particular interest or experience on your part lead to your very specific descriptions?" Sorry Guys for using "technical" terms without explaining - when oil drilling rigs are not active, and being stored awaiting a contract they are "stacked". If they are kept in full working order, ie ready to be towed to a drilling location at perhaps a few days or a weeks warning they are "ready" stacked (or hot stacked). If they are basically moth-balled, and all the equipment is shut down and only manned with a skeleton crew - they are "cold stacked". If you are interested in the full terminology, look here for a list of rigs and their status. This particular rig has been stored in the Cromarty Firth for a few years now, and as it has not been hired by any oil company - as the oil price is so high demand for rigs is at very hot - that suggests that it requires significant investment to get it back to full working order. Interesting point Brandon about terminology. I do not work in the oil industry but have an interest in matters marine, and mechanical, and an obvious interest in photographing such structures. Excepting those who work directly with and on rigs, most folk about I would talk to about the oil industry locally - (fishermen, ferrymen, fellow office workers etc) would be familiar with such terminology, in the same way that I suspect that the workings of a blast furnace would be more commonly understood in a steel town, than a say a lumber town, or one with a biomedical industry. Remember I also post these images to the oil well pool, where people are active in the oil industry. One final point - and perhaps a pedantic one (grin) but Cromarty - where I live - is a town not a village. I'll agree it's a very small town - only 600 souls in the town and 800 in the Parish, but has been a town for 1000 years, and a burgh for the past 800. In fact I can trace one branch of my family tree directly back to a John Urquhart who left Cromarty in 1410 to buy a farm in Orkney, when Cromarty was the second biggest town in the Highlands after Inverness. Reflected Rig, originally uploaded by ccgd. 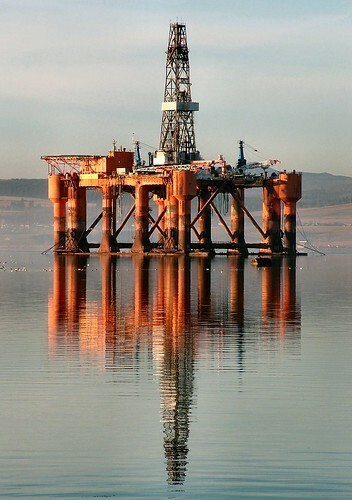 The Transocean Wildcat cold-stacked in the Cromarty Firth. 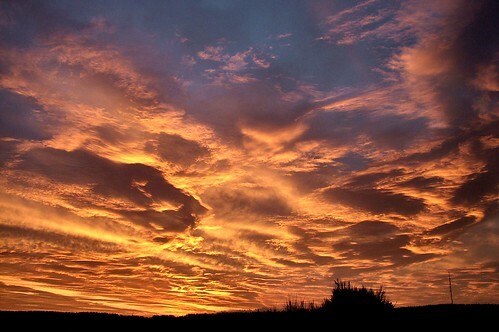 Looking at this shot again, I wonder if the crop is right - I think more sky is needed. A Frosted Family Tree, originally uploaded by ccgd. Took this shot between Christmas and New Year, but only posted it yesterday - the response has been quite dramatic - it made it to the Explore Page and is now in the top 20 of the 2nd of January. 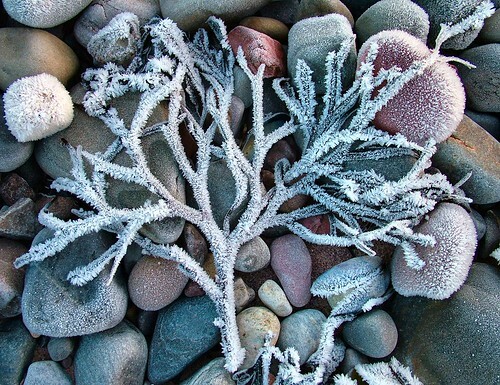 Been enjoying my Photo-walks along the beach a couple of times a day. The weather is cold but sunny, and lots of Tourists out and about. I'm enjoying the break, and the quieter days now that the bustle of the 1st and 2nd is over. Pebbles and Shadows 2004, originally uploaded by ccgd. This shot is exactly a year and a day old - the framing and composition could be better, but I think it's minimalism makes for a neat photo. Just before the Bells, originally uploaded by ccgd. At 11:45 last night - Calum, Hamish, Ruth, Charlie and Magnus, with a wee drink waiting for the bells and before we all went first footing.